Dr Clair Rowden has contributed to a new BBC4 documentary series exploring the transformation of music in the 19th century. Revolution and Romance: Musical Masters of the 19th Century sees Suzy Klein tell the story of how music became the leading art form in an age of political and industrial revolution. 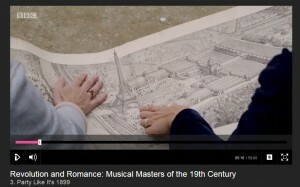 Dr Rowden, whose research focuses on opera and nineteenth-century France, appeared in the final episode to share her expertise on the 1889 Paris World Fair. The episode looked at how the technological advancements of the nineteenth-century allowed music to transcend language and borders. The millions of visitors to the World Fair were able to witness a wealth of musical experiences, from Revolution centenary events, through concerts of consecrated French composers, to the latest recording inventions, as well as listening to music from around the world performed in the temporary pavilions set up on the Champ de Mars. ‘Party like it’s 1899’ was broadcast on BBC4 at 9pm on 14 June.